Jammu, January 02 (Kashmir Voice): In occupied Kashmir, the member of so-called Kashmir Assembly and Awami Ittehad Party Chairman, Engineer Abdur Rasheed, today, staged a protest outside the so-called Kashmir Assembly in Jammu to demand right to self-determination for the Kashmiris. 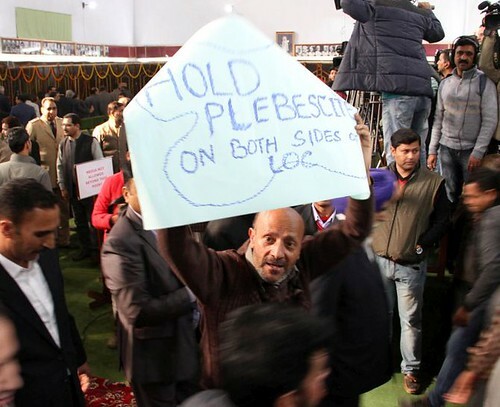 According to media sources, Engineer Rasheed holding a banner with pictures of martyred civilians Misra Begum, Rubi Jan and Asif Iqbal, on the occasion said that the right to self-determination was the only way to settle the Kashmir dispute. Misra Bano, Rubi Jan and Asif Iqbal were recently killed by Indian troops.